We keep our upcoming webinars on our company calendar. Using keyword research to influence your content strategy and earn the right links. Could you be building better links? Check out this Page One Power + SEMrush panel webinar to find out! 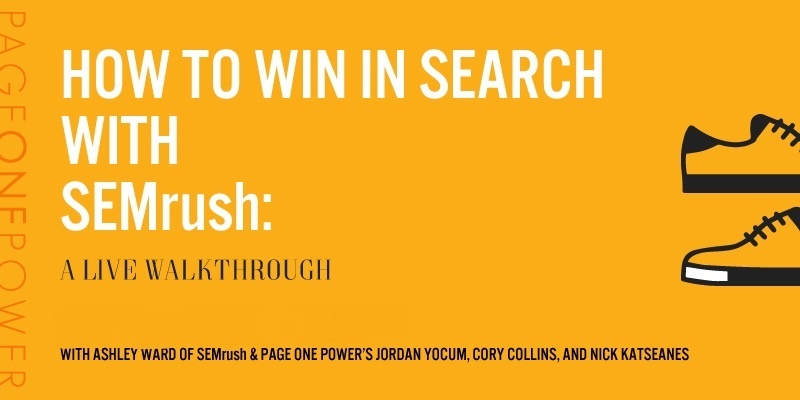 Page One Power’s Jordan Yocum, Cory Collins, and Nick Katseanes sat down for a conversation with SEMrush’s Ashley Ward, where they discussed how to use SEMrush for keyword research to drive better link building results. The best links you can earn begin with analysis of the content on your site. Your hosts explain how to use keyword research to identify search opportunities and guide onsite content strategy. Discover how a strategic approach to link building can drive better results from your campaign. The fundamentals of onsite content creation strategy that drives link building results. How to identify important keyword opportunities. How to prioritize keyword opportunities. Actionable tips for keyword research in SEMrush and data analysis. How to integrate your content marketing and link building strategies. From the experienced team behind 60,000+ links earned. It’s no longer optional to ignore the SEO implications of certain business decisions. Everything from naming a product to designing new page layouts can have huge, and possibly adverse, effects on SEO. Getting blindsided by an issue can be just what your competitors need to pull ahead. For this essential panel discussion, we are being joined by Fernando Angulo, an SEO expert from SEMRush. We will discuss ways to shape your business strategy to incorporate SEO into every strand of your company’s DNA. With the holiday season ramping up, you have less and less time to devote to SEO. We understand that. That’s why we have teamed up with the experts at Bowler Hat for this webinar in order to deliver you the perfect pre-holiday SEO present: Actionable SEO improvements for your business that require the minimum effort, but yield the maximum output. That’s right. We want you to enjoy this holiday season by spending less time on your SEO efforts while still remaining competitive. These no-nonsense tactics will focus on things you can do right now for your business that will strengthen your online visibility and put you in the best position to dominate in the New Year. 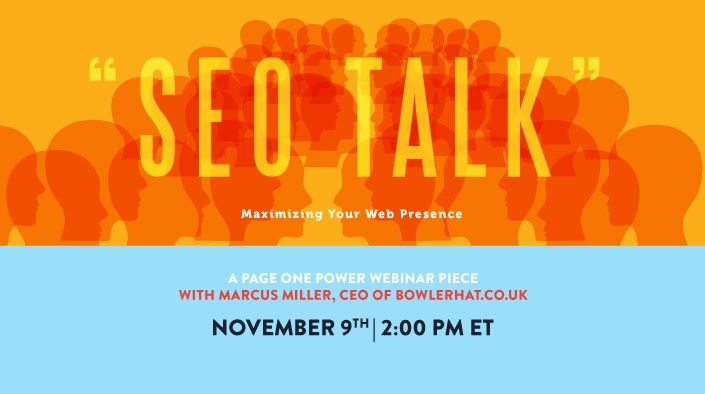 Join our host Colin Eggleston as he welcomes Marcus Miller, CEO and Chief SEO Strategist from BowlerHat.co.uk. We will be talking about SEO, link building, and everything inbetween. How do you engage effectively with people in the ‘real world’ when more and more of our interaction and engagement is done online? Join our host Colin Eggleston as he welcomes Sam Eitzen, Co-Founder of The SnapBar, a photo experience company.During this webinar, we will tackle this question and more. 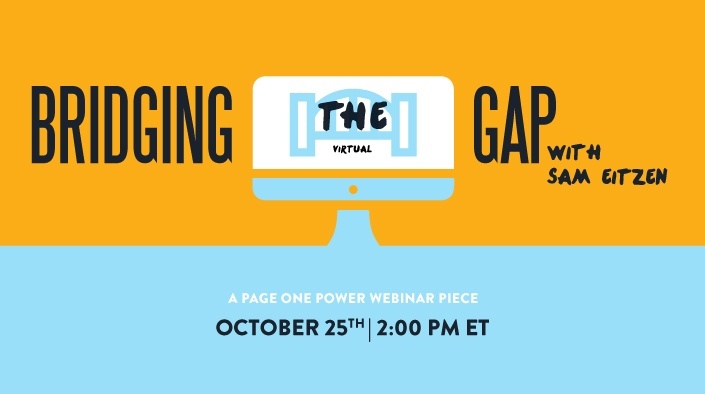 Learn to bridge the ever-widening gap between a great retail experience and a robust online presence. The future of retail depends on a successful strategy both on and offline. Will your business stand out from the crowd as competition for brick and mortar shoppers gets more and more fierce? Sam and Colin will show you how to best incentivize people to participate in your brick and mortar experience while providing digital touchpoints that connect the two. For online retailers, how do you stay connected with your customers offline? Don’t worry, Colin and Sam will be talking about how to achieve just that as well. So, if your business is online or offline (or both), you won’t want to miss this webinar! Want something a little out of the ordinary? Then join us for a spook-tacular webinar! We will be sharing our Halloween SEO horror stories around the virtual campfire. Join our host, Colin “haunted mic” Eggleston as he shares his stories (and SEO tips) with guests and link building experts Devin “bump in the night” Boudreaux and Taylor “the entombed” Tomita. They will regale you with their best SEO horror stories and how to avoid scaring away your customers with their specialized knowledge and experience. You won’t want to miss it! In this webinar, we join Colin Eggleston and Colby Stream as they tackle the web's most frequently asked questions about link building, SEO, and beyond! Join us for another edition of Link Building LIVE for an instructional webinar that will teach you everything you need to know about executing a broken link building campaign from start to finish. During this one hour session, our very own Colin Eggleston will demonstrate a live step-by-step walkthrough and, of course, take questions from our audience. Broken link building is the process of finding links that point to 404 or dead pages on your competitors' sites and asking webmasters to point those links to live pages on your site that are similar or offer the same product. This allows you to help out webmasters clean up broken links on their site and acquire great links to your domain. Check out our Calendar page for the latest information on upcoming trade shows and webinars! Want to take charge of your local rankings? 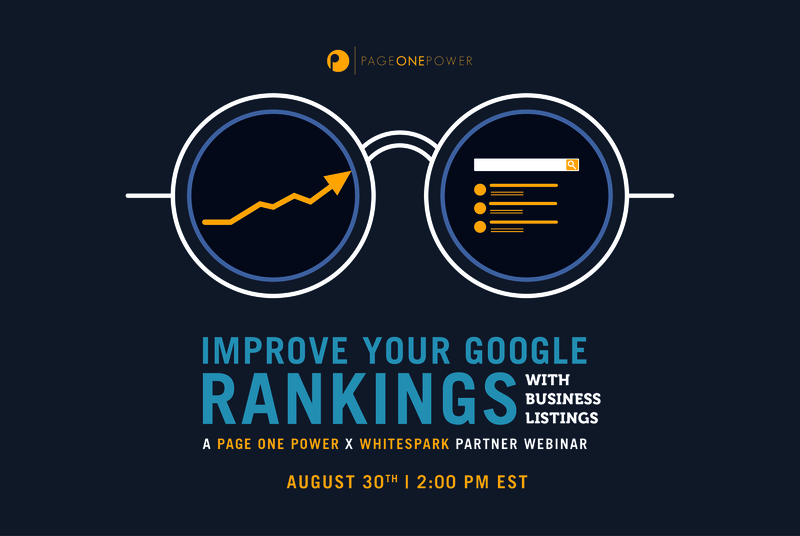 We are proud to announce that Darren Shaw, Founder and President of Whitespark will be joined us for a must-see webinar on mastering local search optimization. Darren shared with us his industry leading experience on how to make your business stand out in local pack. Why citation building is an easy win for any kind of business. How Google generates business listings. Why citations are important for local search rankings. How to find citation opportunities. Join us for a great conversation that will help you increase your site’s local visibility. For this webinar, we are joined by Ryan Meghdies, Director of Operations from Tastic Marketing. Want the latest on how to tweak your landing pages? Is your homepage driving people away? Is your site delivering what your visitors want, or are they going elsewhere to buy the same products? Page One Power is proud to announce that Steven Van Vessum from Content King is joining us for this webinar. We will be talking about SEO disasters and how to avoid them. If you’ve ever had a site-wide SEO catastrophe such as a design team pushing out site wide updates without telling the SEO team, then you’ll want to catch this webinar. Or, if you are lucky enough to have not had that happen yet, tune in so you can learn to avoid that and other calamities! Steven and Colin discuss these situations, how you can work to avoid them, and how to deal with them effectively when they do happen. Here's a link to the slide deck! When the WordPress “update” button gets pressed without warning, and how to deal with the consequences. What to do to fix and prevent sitewide SEO mishaps. How to effectively communicate between SEO teams and other website-facing teams. Join us for a great conversation that will help you survive just about any SEO apocalypse. Also, check out our Calendar page for the latest information on upcoming trade shows and webinars! In this special edition video, we are answering all of the questions that our audience asked during the Link "Building Live! Outreach" webinar that we weren't able to do live on air. Colin Eggleston, Taylor Tomita and Devin Boudreaux answer the call in this short, 30 minute recording. Thank you to everyone who submitted a question and thank you for tuning in! Check out the slide deck below for a link to one of our link building outreach templates! Quick note: The introductions of the panelists is cut off due to technical difficulties with GoToWebinar. The first slide shown is the first slide in the presentation. No content was cut. The panelists are Colin Eggleston, Marketing Events Coordinator, Kyle Ochsner and Ben Allen, Link Building Experts. Tired of low outreach response and conversion rates when link building? Outreach is the cornerstone of any link building campaign and we want to help you make yours a success! We shared link building outreach best practices and in-house tips and tricks. Join Colin Eggleston, Marketing Events Coordinator and a guest link building expert, as they explore the cutting edge tactics that our very own link building team uses every day. Scaling outreach for any campaign size. Outreach tactics to help improve conversion rates. Live outreach demonstrations from industry experts. Social media outreach and other out-of-the-box thinking. Join us for a great conversation that will help you build the relationships and links that you deserve. We shared site prospecting best practices and in-house tips and tricks. Join Colin Eggleston, Marketing Events Coordinator and Devin Boudreaux, Link Building Expert, as they explore the cutting edge tactics that our very own link building team uses every day. Here's the slideshare of the deck we used. Site prospecting best practices that make Page One Power effective. Finding opportunities for all businesses, big and small. Social media prospecting and other out of the box thinking. Listen for a great conversation that will help you find the sites to build the relationships and links that you deserve. Also, check out our Calendar page for the latest information on upcoming trade shows and webinars! Watching your customers journey through the marketing funnel from “awareness” to “loyal customer” is stressful at best. There are so many variables that prevent even the people who love your brand from making a purchase. In our discussion with BounceX, we discuss how modern brands can create the perfect “funnel-wide” plan to maximize visibility, traffic, and conversions, turning stress into success! We show you how to utilize customer data to make informed marketing decisions that will help you grow your bottom line. The data is already there. We can show you how to make the most of it. Maximizing marketing strategy through behavioral data. The ins-and-outs of a rich and complex link web. How to adjust your landing experiences to the behavioral mindset of successful links. All the ways you can explode on the successes your organic traffic. Join us for a great conversation that will help you make the most of the full-funneled organic web. Also, check out our Calendar page for the latest information on upcoming trade shows and webinars! Little Orphan Annie might be cute and cuddly, but orphaned pages on your site are another matter entirely. We’re talking with our partners at OnCrawl about finding and fixing orphaned pages on your website. Poor internal linking architecture can lead to lower rankings, missed conversion opportunities, and reduced engagement from your visitors. Finding orphaned pages and implementing a keyword-focused internal linking strategy is a critical part of any technical SEO audit. Identifying and fixing these issues is also crucial to link building success. Learn how to make sure every page fits within your site’s architecture. Click here to check out the slide deck! Tools to discover orphaned pages. How to implement an optimized internal link architecture. Causes of orphaned pages and steps to prevent their creation. Solutions to fix orphaned pages as you find them. Link Building Live! What Makes a Great Linkable Asset? Page One Power recently hosted a live link building workshop at SEJ Summit in Chicago and it was a huge success. Now, we want to take the show on the road and deliver the workshop and its valuable takeaways to YOU. Click here to see the Slide Share of the deck. Join us as we explore what it takes to launch a successful link building campaign, live on the air. For this webinar we are taking it back to the basics. We are starting from the very question that should drive your entire link building campaign: do I have something worth linking to? We will explore that question and more in the webinar, which will be the first of a three part series of live link building. 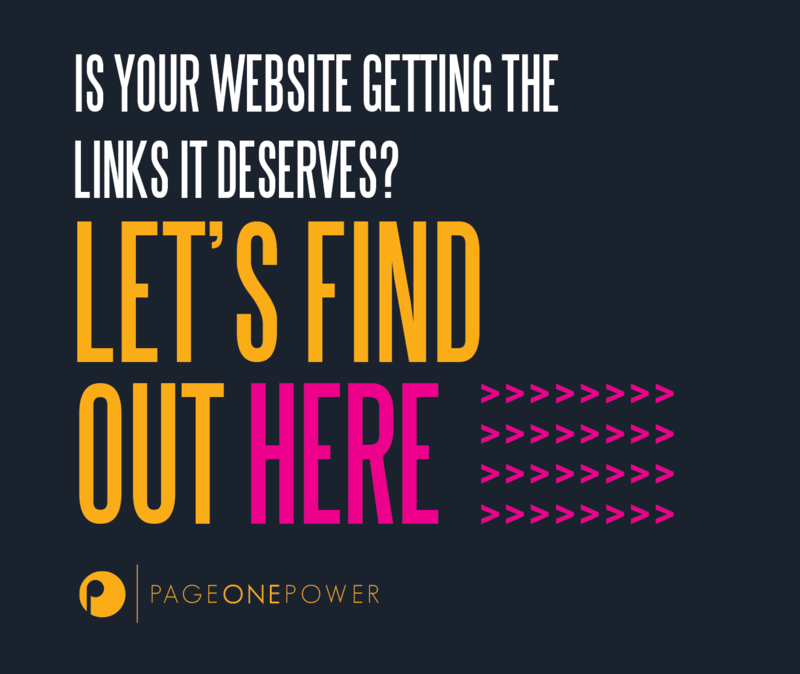 Don’t miss your chance to see how Page One Power’s experts begin every link building journey. What makes an asset linkable? Best practices for creating assets for any industry (that people actually want to link to). Live site evaluations and expert advice. Examples of link-worthy assets across several niches. Page One Power is proud to announce our webinar with our friends at InvisiblePPC. But, that’s not all. InvisiblePPC are bringing a very special guest from Google’s own SEM team. We will be talking to actual Googlers! The conversation will focus on how to integrate SEM into your overall search strategy to maximize brand awareness and conversion. Supercharge your brand’s visibility by pairing SEM with SEO and link building. While they are great on their own, SEM and SEO are always better together. Getting more traffic with paid + organic results. How to increase interactions and conversions. Achieving better real-time control over messaging with paid + organic. How to be there when your customers are making brand decisions. NOTE: Unfortunately we will not be able to share the recording as we planned, per Google’s request. We apologize for the inconvenience. Does your boss not understand or appreciate your work as an SEO? Does it feel like your entire organization is working against you and your SEO goals? Does your organization put more resources into paid search than SEO? If you answered yes to any of these questions we encourage you to listen to this webinar! Special guest David Dalka, Founder and Managing Director of Fearless Revival - CEO and Board of Directors business advisory services joined us. David Dalka has been a member of the search marketing community since 2005 and has spoken at Search Engine Strategies, SMX, Search Exchange and many others. David will be joined by our very own Colin Eggleston in what promises to be a fun and exciting look at business strategy, change, modern management techniques, SEO and link building. For conversion-minded marketers, traffic from Google search and link building efforts can be some of the hardest to quantify. By focusing on the behavioral mindset of organic visitors and using your analytics to double-down on what’s working, marketers can supercharge the value of their organic programs. Join us and friends at Bouncex as we discuss all the ways organic traffic still drives serious value. The video is not available on YouTube, but you can view it here instead! Colby Stream is a Project Manager at Page One Power and shared his expertise on how to develop reasonable client expectations. This is a highly educational and actionable webinar, where he covers effective client communication. Colby has five years of experience managing client communication at Page One Power. No matter what sector of digital marketing you serve, effectively communicating with your clients is essential. Colby demonstrates how to be prepared for even the most difficult conversations. Setting expectations for both lead deliverables and lag goals. How to be accountable for the products, processes, and services your company delivers. Steps to define the “why?” behind your clients’ expectations. Clear communication best practices and handling the most “difficult” conversations. Obtaining “buy-in” from key players on the client side. For this partner webinar, we were happy to welcome Steven van Vessum of Content King, a Content Monitoring and Optimization service. Steven has been in the SEO industry for over a decade. He’s worked with large and small companies from all over the globe, from a variety of niches. Steven has been on both sides of the table: three years on the client side, and eight years spent running an agency. All of this knowledge and expertise culminated when he co-­founded ContentKing. Automating processes to boost productivity. Unlocking the potential of your website via smart monitoring. Seeing the “big picture” in terms of SEO. Using tools and processes to improve traffic and rankings. Analyzing live websites and how they benefited from this process. We teamed up with best and brightest to discuss all things Penguin for this panel webinar. Join Marie Haynes (Marie Haynes Consulting), Paul Macnamara (SEO Consulting Services), Barrie Moran (Hit Reach) and hosted by our very own Nicholas Chimonas (Page One Power). The latest iteration of Penguin (4.0). The recoveries and drops they've seen with clients. How Penguin's move to "real time" affects their work. What they expect in the future for Penguin. Jump into the #SEJThinkTank with our very own Project Manager, Cody Cahill. In this captivating and fast-paced webinar, Cody walks us through best practices and challenges associated with managing a team of Link Builders. We teamed up with our friends at Search Engine Journal for this webinar and answered some great questions from the audience as well. Creating a strong philosophy to guide your link building efforts. What traits to look for when hiring for the unique job of professional Link Builder. How to best tackle building a relationship with clients. How to manage (the inevitable) employee and client churn. Which metrics to use when managing a Link Building team. Want the full slide deck? It’s available for free over at SlideShare. Link Building Live: How Page Level SEO and Link Building are the perfect match! Spend part of your Valentine's day with our friendly neighborhood trainer, Colin Eggleston, as he teams up with Mary Wilson in this jam-packed webinar about on-page SEO and Link Building, and how the two are the perfect pair. Mary is a talented SEO Link Builder working with a multitude of clients in our Production department. Colin and Mary will be looking at live examples of landing pages to optimize and will be taking questions from you, the audience! How page level SEO can help add more value to your link building efforts. Best practices for those just starting to learn about page level optimization. Live walkthroughs of our best practices for on-page evaluation. Fall in love with SEO and Link Building all over again! This is an event you don't want to miss. Our Director of Training, Colin Eggleston, teams up with SEO specialist and writer Daphne Stanford to demonstrate our editorial link building best practices, live. How SEO, link building, and content creation work together. Topic relevance, keyword research, and editorial link creation. Guest blogging, on-site content creation, and editorial column contributions. If you're new to SEO and want to empower your online marketing with links, we've designed this short 30-minute presentation specifically for you. - What is link building? - Why are links important, and what is the value of link building? - General link building strategies. - The link building process. - The results of securing great links.